My Halloween involved no candy and no scary pumpkins...but an old fashioned band, a large dance floor, and a white ball dress! Yes. I am speaking of the amazing Bonnie Blue Ball. 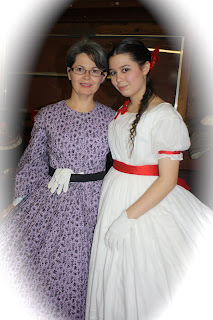 While most people were going up to doors asking for sweets, I was dancing the night away in the 1860's style...a waltz here, a virginia reel there...and having a jolly good time doing so! A mixture, of period music, happy friends, and lady's wearing hoop skirts always proves to be an enjoyable evening! Please feel free to drool over some pictures of the exciting evening! You all look LOVELY!!! Perfect Southern belles! It looks like you had a blast! Plus you look absolutely gorgeous! Hallween treats aside, what wonderful eye candy you have provided this Tuesday morning! oooh! that looks like sooo much fun!!! I wish I had been there!! Beautiful dress! We make civil war era clothes too! Aren't they fun to wear?! YAY!!!! The weekend was such fun and the ball was simply wonderful :-). Those "Halloween" people have no idea what they missed out on. I am oh so glad that you all came... it made the event splendid! And all the pictures are great - thanks. Oh my, what beautiful dresses! :) Just lovely. Love the dresses, they're so pretty. Oh, I'm pretty certain this is my first visit to your blog (I arrived here from the Aria of and Amateur blog.) If you'd like, drop by my blogs. Oh, Footprints in the Sand is my main blog. Thanks for reading this comment. I hope you will join me in celebrating Thanksgiving by counting the blessings God has given! This is Kayla from team twelve brio missions to peru. : ) I saw the link to your blog on facebook. This looks and sounds like soooo much fun. I would love to do things like this if I had a group to do them with. lol. So how are you doing? I'd love for you to visit my blog!! I love your dress! As a reenactor myself I have always wanted a white dance dress. Hopefully sometime this spring I will have one. I have this cotten white sheer with a blue and grey stripe on it that I want use for a dance dress.